Caption slip reads: "Photographer: Emery. Date: 1957-11-08. Reporter: Attn. city desk. Assignment: Arraignment grand theft & forgery. 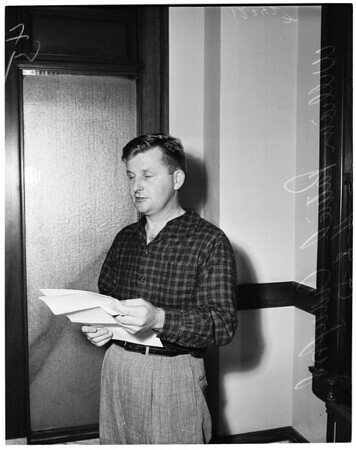 44/45: William Patrick Crawford, Long Beach admiralty lawyer, in court building corridor reading legal paper after his arraignment on grand theft and forgery charges".